Located just within the Oldham County line, you’ll find the well-maintained neighborhood known as Poplar Hill. You will find this neighborhood just outside of the Louisville area right off of Highway 22, also known as Brownsboro Road. The lot sizes are approximately one-quarter acre in size and the homes historically range in price from $200,000 to $250,000. There are a few sales that were not that high but those homes were either short sales or bank owned properties or otherwise were distressed selling situations. Usually, you’ll find homes from 1,400 to 2,200 square feet. You can typically find three to four bedrooms and two to three bathrooms in each home. On a daily basis, The Hollinden Team updates their search of homes in Poplar Hill for sale. If you are looking for a REALTOR, The Hollinden Team would love to assist you. A lot of our buyers have provided The Hollinden Team with positive reviews. Feel free to use the Advance Search Tools of our Louisville MLS to find other houses for sale in Oldham County. Click the map to the left to view each home for sale in Poplar Hill. There is a satellite view in upper right. Most of these homes are either vinyl or brick and some of the homes are both brick and vinyl. Most homes in this neighborhood have a basement. In some of the homes under $185,000, you will not find a basement. The homes in Poplar Hill were built starting around the late 1990s but some are more recent. The neighborhood does not have an HOA fee per se, but there is a small city tax as it is part of the Orchard Grass tax district. This neighborhood borders Orchard Grass and Briar Hill Estates where you will find a small local park within walking distance of Poplar Hill. In Briar Hill Park you will find tennis courts, sand volleyball courts, swing sets, a pavilion, restrooms and plenty of room to run. If you are interested in golfing, there are several golf courses near Crestwood. A few of the golf courses near Crestwood that you may want to check out are Persimmon Ridge Golf Course, Eagle Creek Golf Course, Oldham County Country Club. 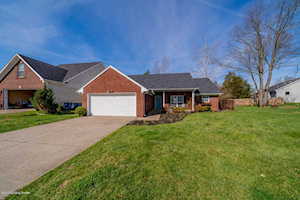 This is one of Oldham County’s finest neighborhoods for its price point, as it has the Oldham County School System yet is only about two miles to shopping and dining towards Louisville with The Paddock Shops, formerly known as The Summit, just up the road. Some of the restaurants you’ll find at The Paddock are Express, Bath and Body Works, Bed Bath and Beyond, Barnes and Noble, Versona, Gap, and DSW. Some of the restaurants you’ll find in Paddock Shops are Stoney River Steakhouse and Grill, Potbelly, Qdoba Mexican Grill, Mitchell’s Fish Market, and Five Guys Burgers and Fries. If you would like to learn more or have any questions about any of these Poplar Hill houses for sale, or others in the zip code 40014, just click the "Request More Information" button on any property detail page. The Hollinden Team can provide you with past sale information, comparables, disclosures, PVA assessment, and tax information – we would love to answer any real estate questions you have.